Hi there dear friends! How is your summer?? We finally found ours and boy has it been hot! While most people are saying they are ready for fall, I have to be honest I'm not ready to let go of summer at all! This is actually really out of character for me but I love not having to wear so many layers. It's hard on my neck. Geez, I sound like an old lady! But it's the truth. Well not the old lady part... I'd like to think I still have a long while before I'm grouped into that category. Anyhoo a month ago I was contacted by Rocksbox to collaborate a few styled shoots with their jewelry. I decided not to share about them until I had a chance to sample their set for myself. I wanted to give you my thoughts and an honest review. I don't believe in sponsoring anything I haven't tried myself first. In 3 simple steps you set up an account, create a wishlist + take a survey, then return the jewelry when you want something new. Each set comes with 3 pieces. Sound easy? I thought so and decided to give it a whirl. Upon first opening my package I discovered a cute little box. This jewelry is well packaged. Inside is a lovely and personal letter just for me. I'm such a sucker for mail, especially when the sender goes the extra mile with little details like these. Inside, the letter goes on to describe my jewelry and how it was picked just for me and my style. They even give you the option to purchase the jewelry for a discounted price should you really love it. All prices included. All the jewelry came wrapped in bubble wrap and in individual organza drawstring bags. My first set came with their Perry Street Necklace that I had added to my wishlist. A stylist then picked a ring and earrings to go with my set. 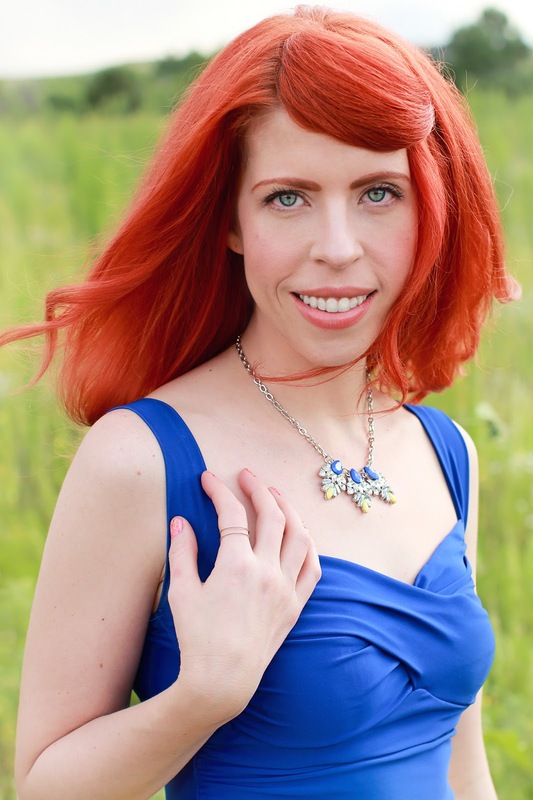 When it comes to jewelry I can sometimes be a bit lost with how to style it. I usually don't wear a ton of jewelry because of that, even though I do love to wear it. I love the idea of someone helping me pick out matching pieces that I might not have normally picked. 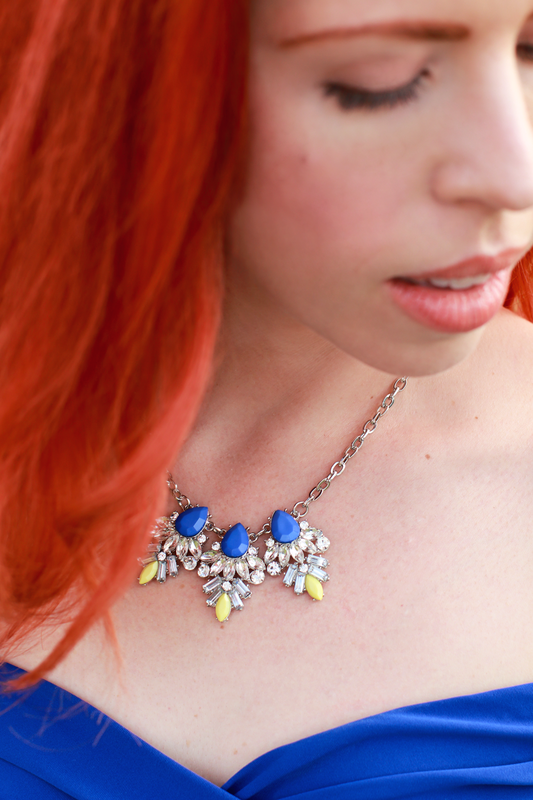 I love statement necklaces/ costume jewelry. They are timeless pieces that in my opinion never go out of style. Alas so many that I have bought in the past were quite heavy and not practical to wear for any length of time. While I cannot speak for their whole line, I was pleasantly surprised with how light this necklace was. It made wearing it all day a breeze. I will note that this necklace did have a stone that was not set right. While that might not bother most the OCD in me did find that a bit annoying. Had I bought this piece I would have re-glued it properly or requested a better one. As for the price, I found it a bit steep but still completely affordable. Then again most costume jewelry is pricy. If I had insisted on keeping this one it wouldn't have broken the bank... $44. But again most of my jewelry is vintage and bargained for cheap. I did waver on buying it but the mystery of what I would get next made me decide to return it this time. Final thoughts, I loved each piece I received! It was a perfect starter set and while I'm not 100% sure if I will continue with my membership after my sponsorship is over, I am extremely excited for my next box. 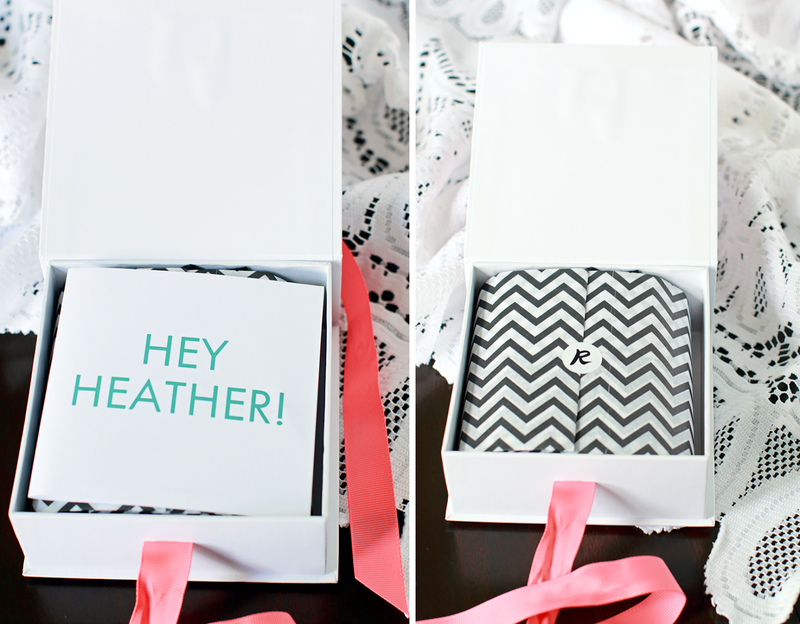 Rocksbox has given me a discount code for you to try out your first month free too! I definitely think it's worth giving them a try, you can cancel at anytime. Why not pamper yourself and see what picks you get! So fun! Like you, I would never spend $44 on a piece of jewelry. I would rather put that money toward my next dress!! =D I also love that royal blue on you - I have been collecting all the pinup tops in various colors along the way but have yet to get the royal blue. Perhaps it should be next on my list! Yes! I always think that extra $ could be another dress! I'm such a sucker for dresses though. And thank you! I've become quite fond of this color and think it's my favorite of my pinup tops! I bet that color would look amazing on you too! 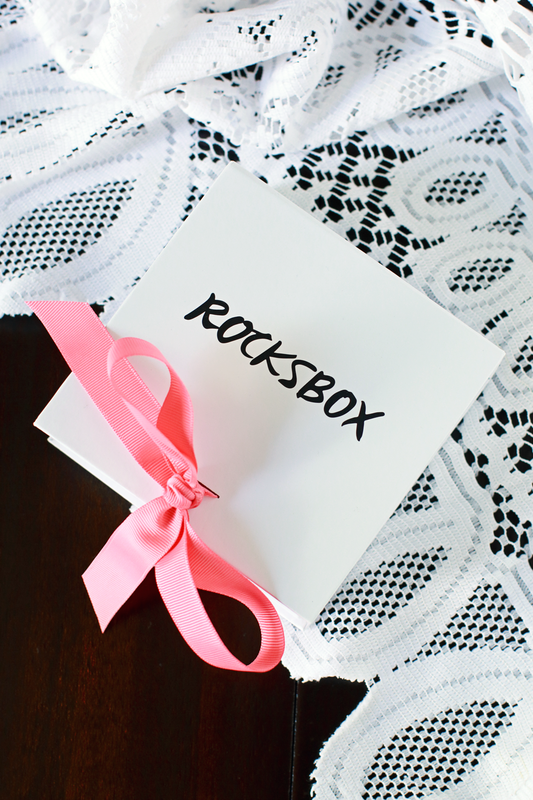 Rocksbox sounds like a fantastic idea! I find myself, like you, either not wearing jewelry or wearing the same necklaces/earrings over and over again. This actually sounds like a great idea for a fashion blogger, to keep some variety going. I will have to give your promo code a whirl - thanks for sharing! 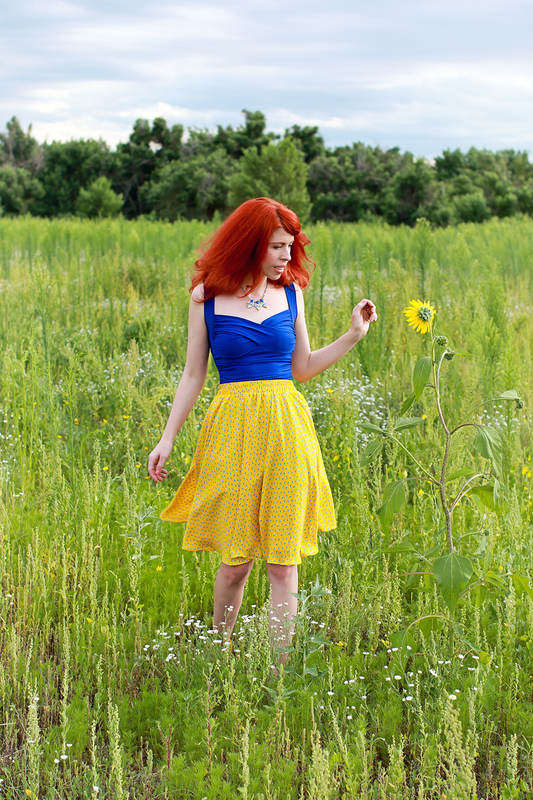 I also love, love, love the colors in this post! So pretty! You should definitely give them a try! I've had quite a blast wearing their jewelry. It's nice having a set styled around something I picked out. The statement necklaces are without a doubt my fav. I've been hearing about Rocksbox, and actually they contacted me as well but I wasn't sure if I would continue my membership after the sponsorship was over so I decided not to. So I'm glad I'm not the only one! They do have GORGEOUS jewelry, though; Rya Pie wears their jewelry pretty often, and I'm always admiring it! I love the necklace especially; that design is right up my alley! I rarely wear jewelry either, except post earrings, but I'm trying really hard to incorporate more of my pieces into my style because I have SO much I've collected and it's a shame to leave it all sitting unworn! I love your outfit, too! That blue is gorgeous on you. And hey, we have the same shoes! <3 They're the best! Since being with them it really has encouraged me to sample jewelry more. I usually just stick to one piece if any (usually earrings) but now I'm finding myself looking for ways to style around a necklace! It makes outfits a bit more adventurous and challenging (in a good way). Thank you btw! 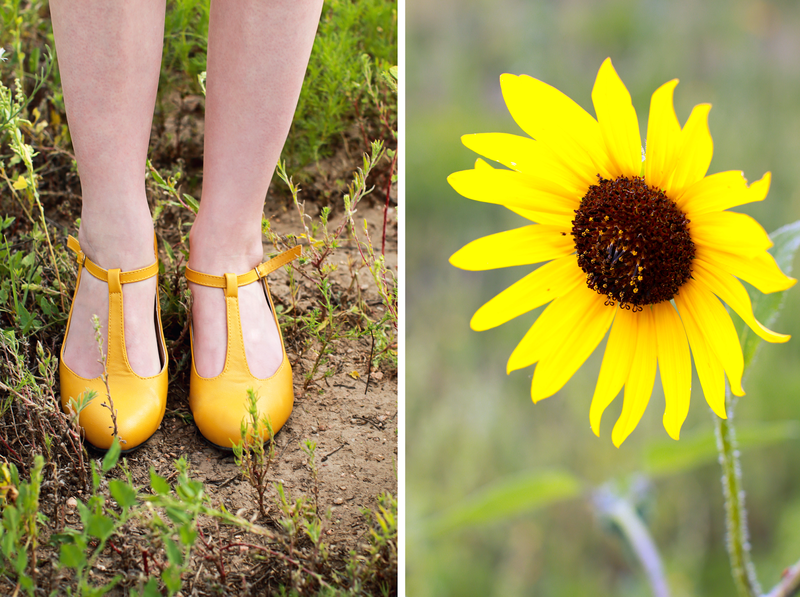 In truth after seeing your lovely yellow shoes I wanted a pair too, so I have you to thank for sharing them first! They're so comfortable. Thank you! I have to say I love wearing these colors together! Thank you! I keep crying on the inside every time we have another rainy cold patch. I feel fall is defeating summer. Nooo! I better get out there more and enjoy it before it's all gone. Although I'm really hoping for a warm fall. I truly do love fall (when I'm not cheated of summer that is). If we can have a warm Halloween I'll be satisfied. What a gorgeous necklace!! Of course, I only see your outfit. Gosh I love how daring you are with colors!!! Thank you! I'm rocking a 50's style Snow White! lol!